DO AS MUCH AS ANT CAN was performed on November 28th in the frame of 20. International Ankara Theatre Festival. 2014 - 2015 season of PEMBE KURBAĞA STAGE has passed with plenty of applause as we wished. We wish to be together in October in the new season. The play that is written by La FONTAINE and directed by Ali Nihat YAVŞAN is the story of Ant who works during the summer and relaxes in the winter, Cricket who wants to sing and to dance all the time, and Grandam. In the play for 3-10 years old, Music Arranger is Öykücan YAVŞAN, Costume Designer is Güneş ÇAKMAKOĞLU and Stage Designer is Figen ÇAKMAKOĞLU. The Cast is Ali Nihat YAVŞAN, Gülşah ÇAKMAKOĞLU, Öykücan YAVŞAN, Duru YAVŞAN and Asal ÇAPAR. The play of LITTLE MERMAID, written by Figen ÇAKMAKOĞLU and directed by Ali Nihat YAVŞAN brought to the stage to the story of Little Mermaid. Although her mother's warnings, Little Mermaid is engrossed in play with the waves and swims away from home. In the play for 3-10 years old, Costume Designer is Güneş ÇAKMAKOĞLU, Stage Designer is Figen ÇAKMAKOĞLU. The cast is Ali Nihat YAVŞAN, Gülşah ÇAKMAKOĞLU, Öykücan YAVŞAN, Duru YAVŞAN and Asal ÇAPAR..
KARAGÖZ FISHERMAN, written & performed by Ali Nihat YAVŞAN, is a play to introduce and popularize our traditional shadow theatre to all ages, especially children. At the end of the play, a short workshop is made to introduce the characters. In the play for all ages, Costume designer is Güneş ÇAKMAKOĞLU, Stage Designer is Figen ÇAKMAKOĞLU. The cast is Ali Nihat YAVŞAN (Master), Gülşah ÇAKMAKOĞLU and Asal ÇAPAR. MAGIC TRIP with ALİ NİHAT is a magic play, directed & performed by ALİ NİHAT YAVŞAN. In the play for +3 years old, Costume Designer is Güneş ÇAKMAKOĞLU and Stage Designer is Figen ÇAKMAKOĞLU. Plays for 3 years old and before, which are the first and only in Turkey and have received great interest and appreciation for nine years by the playgoers are also going on in this season. We met with the tiny children in a new play in eight weeks as usual. These plays which we take great pleasure to perform and live a different experience in each performance began with MY BEAUTIFUL BED in the new season. It were performed DEAR SNOWMAN in January and February, BIG ELEPHANT in CARROT FIELD in March and April. 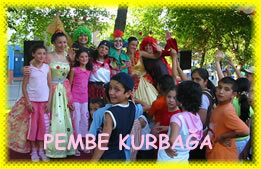 With the organisation of Pembe Kurbağa Entertainment Club, birthday parties, ceremonies, parties, entertainments and picnics, in short all special events turn a high quality entertainment world. 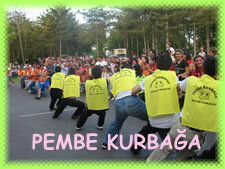 Pembe Kurbağa Entertainment Club that has a reputation for discipline and fastidiousness in the field of entertainment is going on making the parties unbelievable in both kid and adult amusements. OUR ADS IS OUR WORK.. Since 1984..
Beside the entertainers who make colorful to your special events in the costumes over 80 , music, party games, bouncer houses, fun food, decorating etc. DREAM.. WE'LL MAKE IT REAL..